Patrick Bates, of Valparaiso, shows some of the documents he has presented to the BMV to try to acquire a REAL-ID driver's license. Patrick Bates holds his birth certificate for Patrick Allen, as he was known then, and his driver's license for Patrick Bates, the name he has used almost all his life. Patrick Bates' birth certificate is in the name of Patrick Allen. The name change is preventing him from easily acquiring a REAL-ID. Tony V. Martin, The Times. Patrick Allen became Patrick Bates more than 70 years ago when he began using his stepdad’s surname. 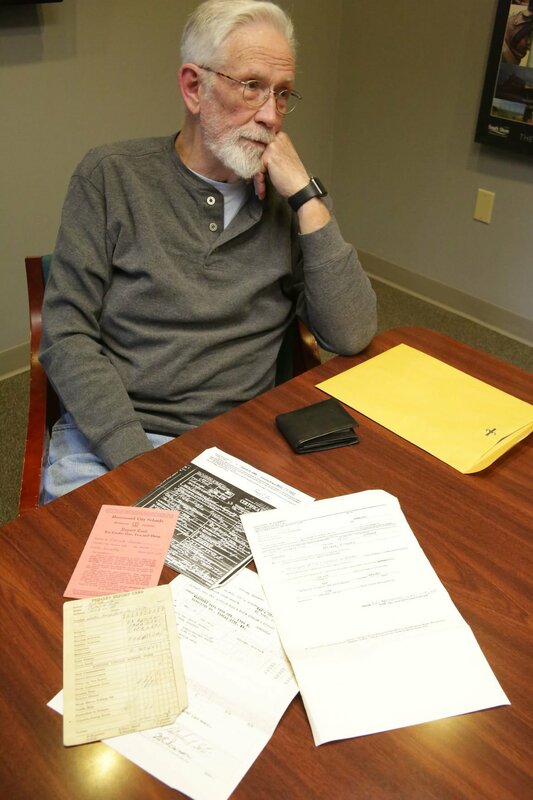 Bates, now 76, whose birth certificate reflects his original name of Allen, said his Nov. 30, 1942, birth record is preventing him from upgrading his driver's license to REAL-ID status. "When I was 3 or 4, my mom remarried and my stepdad fed me, clothed me, educated me and gave me his name. He was my dad. He never formally adopted me," Bates said. Bates, a Valparaiso resident, said when he went to his local Bureau of Motor Vehicles branch, he came armed with a long string of documents bearing his Bates surname. That paperwork included his first-grade report card from All Saints Elementary in Chicago, his diploma from Mount Carmel High School in Chicago; Secret Service clearance from the U.S. Marine Corps, which included time spent in Vietnam; his driver's license, which goes back 60 years; and his Social Security card. Even with a folder full of documentation bearing the name he has used since he was a preschooler, Bates was denied the REAL-ID upgrade because the names on the birth certificate and his other paperwork don't match. "Rules are rules, but sometimes common sense needs to prevail," Bates said. Bates said he has even contacted the office of state Sen. Ed Charbonneau, R-Valparaiso, and a staff member went to bat for him. Bates said he received a call from the bureau the next day letting him know he should probably contact a attorney, who would make his presentation to a judge. "This step seems unnecessary. I won't be able to get on a plane. It's disappointing; almost Kafkaesque. Why should I go through the expense?" Bates said. If Bates wants to get his REAL-ID, the most expedient way of addressing the issue is to go to his county court to legally change his name on his birth certificate to match the name on his other documents, said Christine Meyer, the state's Bureau of Motor Vehicles communications director. "Since individuals used to be able to get a Social Security card with any name they wanted, I assume his Social has the last name Bates and not Allen. If that is true, and his residency documents have Bates as well, his best option is to complete a name change to Bates so all documents match. He can bring the court order from the name change as proof to obtain his REAL-ID," Meyer said. Beginning Oct. 1, 2020, a REAL-ID-compliant driver’s license, permit or identification card will be required for Indiana residents wanting to board commercial airplanes or enter certain federal facilities, Meyer said. It is a federally mandated security standard, enacted following the Sept. 11, 2001, terrorist attacks. It is intended to ensure every state follows similar processes for issuing and producing driver's licenses and state identification cards. A REAL-ID is required for everyone applying for a new Indiana credential (driver’s license, learner’s permit or identification card). Those who are not United States citizens (legal temporary or permanent residents) are required to have a REAL-ID and must present full documentation proving identity (name and date of birth), Social Security number, lawful status in the United States and Indiana residency. Those who are renewing, amending or replacing their current Indiana credentials have the option of applying for a REAL-ID or a non-compliant credential, but are encouraged to obtain a REAL-ID-compliant credential, Meyer said. To upgrade to REAL-ID, all customers must visit a BMV branch and bring the required documents. Only original versions or certified copies of the required documents will be accepted. REAL-ID-compliant licenses and ID cards look the same as previous cards except they have a circle with a star in the top right corner of the credential, while non-compliant licenses and ID cards display “federal limits apply” on the face of the card. "We're working to get the message out there so people know what to do," Meyer said. Meyer said Bates' case isn't that unusual. "If it happened to one person, it's happened to someone else," Meyer said. Porter County Clerk Jessica Bailey, after speaking with the records team, suggested Bates go to the Social Security office first and see if it could assist him in streamlining the process, and then he should petition the court for a name change, something she believes he can do on his own without an attorney. The name change forms are available online, Bailey said. For those wanting to complete a name change request in Indiana, go to Indianalegalhelp.org and click on "name change forms." Those seeking a name change can follow the steps. There is also an online list, on the website, of pro bono or limited-cost legal services depending on which district an individual lives in, a deputy clerk said. Joann Weaver, who also lives in Valparaiso, successfully obtained her REAL-ID, but it took her three months and cost her about $70 to obtain documents from Tennessee. Weaver, 83, said she and her husband went to the local branch at the same time last summer. "We had the same identical information, except I was married and divorced once before," Weaver said. She said she was rejected in obtaining her REAL-ID upgrade after showing her divorce paperwork. Instead, Weaver said, she was asked to provide her first marriage certificate, issued in Tennessee, which she didn't have with her. The marriage certificate was deemed necessary because the Valparaiso woman uses her former married name as her middle name on her present paperwork, she said. Weaver initially contacted someone at the county level in Tennessee, was told they didn't have her paperwork, and then they referred her to an office in Nashville. Rapport with a clerk there led her to get the marriage certificate, only to find her ex-husband's name was misspelled. "At first she said she couldn't change the spelling, but then she looked at his signature, which had the correct spelling, and she agreed to correct it," Weaver said. Weaver said she went back to the local branch for a second time and was told that time that the first name on her birth certificate was spelled differently, JoAn, instead of the way she has been spelling it, Joann. "They wouldn't accept it," Weaver said. She petitioned the state of Tennessee, which went back in its archives and made the change to the spelling on her birth certificate. "Even though I'm 83, I did have the presence of mind to go through all the steps," Weaver said. She suggests to all going to obtain their REAL-ID that they start early and not wait until the last minute. "I started in the end of May, and it was at least mid-July before I got it. I admit I was stressed out," she said. Weaver said both she and her husband drive and try to live independently, including driving their own car to take care of errands and doctor appointments, since their children don't live nearby. "I think there should be a better way," Weaver said of her experience. Those with questions about obtaining information for their REAL-ID can contact the Indiana BMV call center at 888-692-6841 and speak to a representative or go to REALID.IN.gov.